28 / the tasting panel / september 2017 S eptember looks to be memorable for Scotch whisky. In addition to Glen Moray's 120th birthday celebration, the month sees the birth of a new distillery on the tiny island of Raasay. Raasay is just a short ferry ride from Skye (home to the mighty Talisker) but, apart from some illicit activities in the Victorian era, it has never had a distillery to call its own. That gap will be filled starting September 15th, when the newly-built Raasay Distillery officially opens. It's the brainchild of Alasdair Day and business partner Bill Dobbie. Back in 2009, Alasdair launched his Tweeddale Blend as a tribute to his great-grandfather, who had created his own blend in the family's small licensed grocery (a traditional food and liquor store, once commonplace on Scotland's high streets). The new whisky was an unexpected success; one thing led to another, and now Raasay has its first whisky. The single malt—which I expect to be very tasty—won't see the light of day until late 2020, but enthu- siasts are already securing their own casks through membership of Raasay's Na Tusairean club (Gaelic for "The Pioneers"). Given the excitement surrounding small-batch single malts right now, that may prove a sound buy. No need to wait, however, for the latest release from Laphroaig, on nearby Islay. Each year, Laphroaig Distillery Manager John Campbell crafts a limited-edition malt to celebrate friendship ("Cairdeas," for the Gaelic scholars among you). For several years, the Friends of Laphroaig have apparently been yearning for a cask-strength version of the popular Laphroaig Quarter Cask expression. This year, that dream becomes a reality with Laphroaig Cairdeas Quarter Cask. The 2017 bot- tling of Cairdeas features different ages of Laphroaig, matured for more than five years in first- fill bourbon casks, then laid to rest for a second time in smaller quarter casks. After six months of further maturation, the liquid from 177 of the casks was bottled at cask strength with no color added, no chilling and a simple barrier filtration. 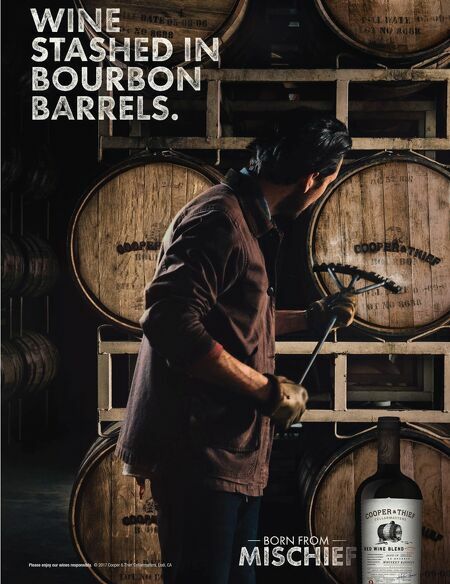 It's a mighty 57.2% ABV—a lot of whisky for a SRP of $79.99. Back on the mainland, Highland giant Tomatin has released to the U.S. just 100 bottles of the ultra-rare 1972 Edition single malt from its Warehouse 6 Collection, the sec- ond in the series. At a SRP of $4,000, it's probably not for everyone, but there will surely be dedicated fans looking to try a wee drop. For more information on this exclusive— and exquisite—dram, contact distribu- tor Phillips Distilling in Minneapolis. Finally, news of a distillery as large as it is obscure. For years, Loch Lomond concentrated on producing substantial quantities of a range of spirits for the lower end of the market. But hidden in the distilling complex was a single malt distillery known as Inchmoan (after an island in the loch), capable of making quality whisky if granted enough time for maturation in good wood. The company changed hands recently, and the new owners have been searching the warehouses for some special casks. The result: two exceptional single malts from the Island Collection: Inchmoan 12 Year Old and Vintage 1992. "I have selected three dif- ferent spirits, each bringing a unique peat character- istic, whether that's spicy, medicinal peat or smoky peat, to the Inchmoan 12 Year Old," says Master Blender Michael Henry. "This combination cre- ates a balanced, complex peat character highlighting some of the softer, spicier peat notes often masked by heavier peat flavors." The importer is A. Hardy U.S.A.; the SRP for the Inchmoan 12 Year Old is $59, and the Inchmoan Vintage 1992 is $249. They are certainly drams to intrigue your more enthusiastic malt whisky customers! 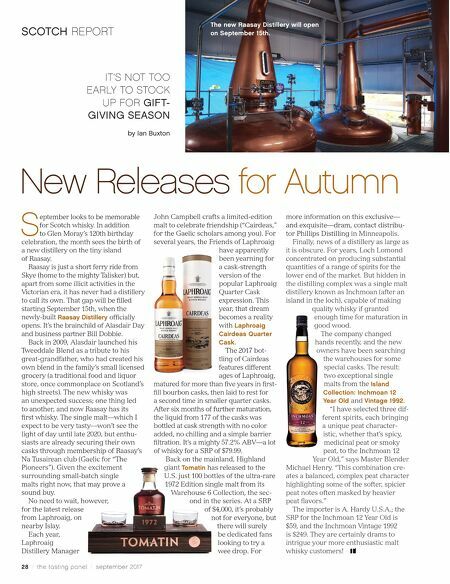 SCOTCH REPORT New Releases for Autumn IT'S NOT TOO EARLY TO STOCK UP FOR GIFT- GIVING SEASON by Ian Buxton The new Raasay Distillery will open on September 15th.